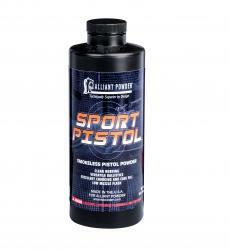 RADFORD, Virginia – Alliant Powder, a leading manufacturer of smokeless powders, offers precision and action shooters consistent, clean-burning propellant with the release of its new Sport Pistol powder. Shipments of the new powder are being delivered to dealers now. Sport Pistol provides extremely reliable cycling, excellent charging and case fill, and ballistics that lend themselves to a range of popular loads. Sport Pistol also delivers precise performance with all bullet types, but the low-muzzle-flash formulation was optimized for polymer-coated bullets. Other double-base powders can dissolve the polymer coatings at the bullet base, exposing the lead to vaporization due to the intense heat during the ballistic cycle. The medium-fast burning Sport Pistol is also very temperature stable, so there is little velocity deviation to worry about at seasonal competitions.